We had arrived at Nossob Rest Camp in the Kgalagadi Transfrontier Park late in the afternoon the previous day and checked in at the reception with our ‘permit’ still intact and generally checked out our immediate location. There are a few things at the Nossob camp that would be of interest for the first time travellers/photographers to the Kgalagadi Transfrontier Park. Firstly the camp has ‘electrical power’ via its generator daily from 5-30am to 10pm, Secondly it has a shop and petrol, both of these are far and few between in the Kgalagadi Transfrontier Park. Lastly, Nossob has a great ‘hide’ with a made made ‘water hole’. This hide is located beside the main ‘North’ and ‘South’ gates (more about this later) to the camp and thus is in easy walking distance from the camp. This hide also boasts a webcam which since returning home and checking it out seems to be up and running all the times I have visited. You can find this webcam and other SanParks webcams at the Nossob Webcam. We had done our research and visited the previous afternoon a waterhole about 10km north of the camp called ‘Cubitje Quap’ known for its large flocks of Sandgrouse and Cape Turtle Doves, large Raptors and Black-backed Jackal all coming to drink there as well as some specials like Brown Hyena and Leopard. This waterhole is better for photography first thing in the morning due to the ‘light’ on the waterhole itself and has limited space around the waterhole to take photographs, so we were up early as normal and first at the gate going ‘North’ to get a good location for the mornings visit of the various wildlife species. Nossob Rest Camp is ‘fenced’ unlike the Khalahari Tented Camp we had previously stayed at and one of only a few camps that are actually fenced in the Kgalagadi Transfrontier Park. Nossob is also a little different to all other camps I have stayed at before, as here you have to actually drive ‘into’ the camp. shut the gate and then open the other gate to continue. So coming from the south you would need to open the South gate, close it and open the North gate to continue your journey or vice versa. 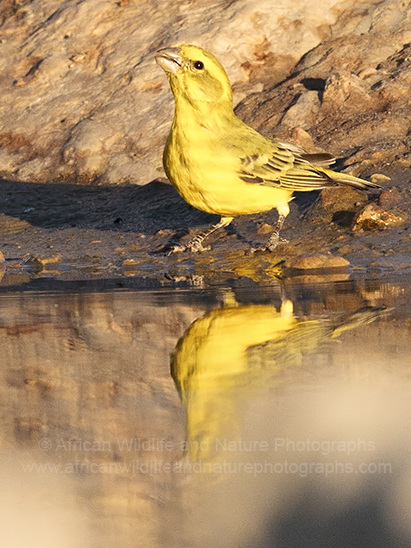 We arrived first at the waterhole just after sunrise and we positioned ourselves the best we could with a good view of the waterhole some 30 meters away, It wasn’t long before a whole host of birds started to arrive, Yellow Canaries (Serinus flaviventris), Red-headed Finches (Amadina erythrocephala) were amongst the first to appear in their droves, quickly flying in and ‘sipping’ the cool early morning waters and then out again to rest on a nearby bush, hardly resting for a moment before starting over again for a further drink. 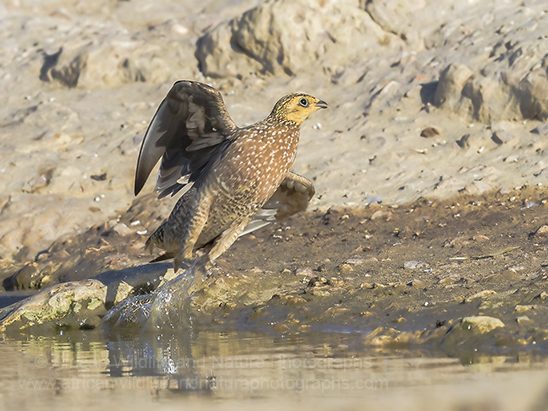 We soon found out why this curious back and forth of birds continued; it’s due to one of the famous predators of the Kgalagadi Transfrontier Park the ‘Lanner Falcon’ (Falco biarmicus). It swooped in narrowly ‘missing’ a couple of these small birds before returning to its look-out some 100 meters away in an old tree with a good vantage point to see the waterhole. circling a few times like ‘bomber command’, flocks of Namaqua Sandgrouse (Pterocles namaqua) and Burchell’s Sandgrouse (Pterocles burchelli) came in one after the other to drink and then take off in the opposite direction in which they landed. Again the Lanner Falcon swooped in, this time ‘clipping’ a Namaqua Sandgrouse but not sufficiently enough to knock it down. This is a deadly scene that is played out daily in the Kgalagadi Transfrontier Park for these birds, a balance based on a need for ‘water’ and a need for ‘food’. 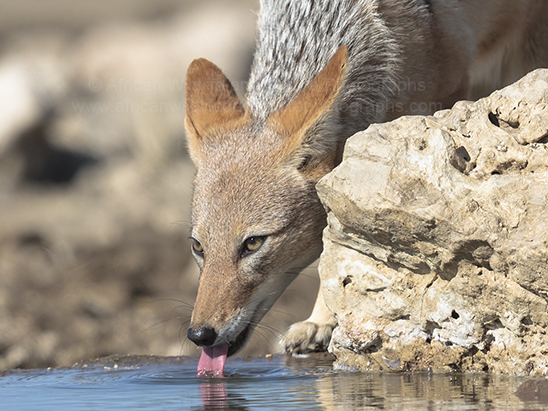 Next up to drink and our only large mammal that morning was the ‘renowned’ scavenger of the Kgalagadi the Black-backed Jackal (Canis mesomelas), This predator was also very nervous as it drank there for a good few minutes, always raising it’s head and looking around every few seconds. We guessed this was to be on the look out for the Kgalagadi Transfrontier Parks apex predators the lions. Unfortunately for us and fortunately for the Jackal none appeared while we were there. We spent most of the morning at Cubitje Quap watching and photographing the comings and goings of the birds and various Jackals. Later that morning we moved further North to ‘Kwang’ waterhole where it is said to have a large ‘sweet’ waterhole preferred by many animals. Sure enough the hour we sat there, large herds of Blue Wildebeest (Connochaetes taurinus) and Red Hartebeest (Alcelaphus caama) as well as the occasional Jackal and the now common flocks of birds came to drink. We made our way back to Nossob for lunch and then took ourselves South this time for an afternoon drive to ‘Rooikop’ and ‘Marie se draai’ waterholes. Not a lot happening unfortunately at the waterholes so we made our way back to camp and the hide, again not much happening there either so we decided to comeback later that evening for a second sitting as it was our last night at Nossob Rest Camp as our winter trip to the Kgalagadi Transfrontier Park was nearing an end. The night session was also quite quiet but the highlights were a Verreaux Eagle Owl (Bubo lacteus) which landed some distance from the hide just out past the waterhole and five Bat-eared Foxes (Otocyon megalotis) who also just ran through the area and didn’t stop to drink. We decided to make for our chalet and ensure a nice hot shower and cup of tea and jump into bed before the power went off. Tomorrow we were heading back down to Twee Rivieren Rest Camp and we’d also heard that the weather was going to take a turn and temperature were due to drop.